References DELETEP, AP_TopRuler::getView(), m_hwndTopRuler, and AP_TopRuler::m_pG. References XAP_CustomWidgetLU::draw(), EV_EMB_BUTTON1, EV_EMB_BUTTON2, EV_EMB_BUTTON3, FV_View::getPoint(), AP_TopRuler::getView(), GWL, GR_Win32Graphics::handleSetCursorMessage(), GR_Win32Graphics::init3dColors(), AP_TopRuler::isMouseOverTab(), AP_TopRuler::m_pG, AP_TopRuler::mouseMotion(), AP_TopRuler::mousePress(), AP_TopRuler::mouseRelease(), s_GetEMS(), signedHiWord(), signedLoWord(), GR_Graphics::tlu(), UT_DefWindowProc(), and UT_return_val_if_fail. References DELETEP, XAP_App::getApp(), AP_TopRuler::getGraphics(), XAP_Win32App::getInstance(), GR_Win32Graphics::init3dColors(), m_hwndTopRuler, AP_TopRuler::m_pG, XAP_App::newGraphics(), AP_TopRuler::s_iFixedHeight, s_TopRulerWndClassName, AP_TopRuler::setHeight(), AP_TopRuler::setWidth(), SWL, UT_CreateWindowEx(), UT_DEBUGMSG, and UT_return_val_if_fail. References _TopRulerWndProc(), UT_Win32LocaleString::c_str(), UT_Win32LocaleString::fromASCII(), XAP_App::getApplicationName(), XAP_Win32App::getInstance(), s_TopRulerWndClassName, UT_ASSERT_HARMLESS, and UT_RegisterClassEx(). References DELETEP, XAP_App::getApp(), GR_Win32Graphics::init3dColors(), m_hwndTopRuler, AP_TopRuler::m_pG, XAP_App::newGraphics(), and UT_return_if_fail. 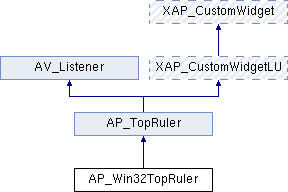 Referenced by AP_Win32TopRuler(), createWindow(), setView(), and ~AP_Win32TopRuler().